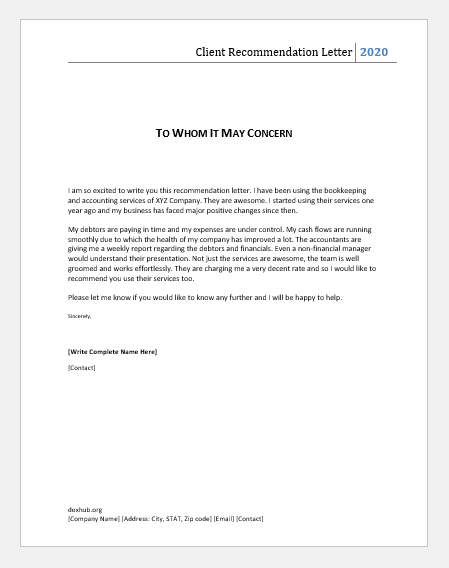 Clients, vendors and customers can write recommendation letters on behalf of the product or service they have used. Recommendation letters and testimonials can be a good way to attract new customers. Customers like to read reviews of people who have already used the service before. Some businesses can be conscious when trying a new vendor. For this reason, people are asking to refer them specific services. Recommendations are also a form of business and it can help you get discounted prices from your service provider. 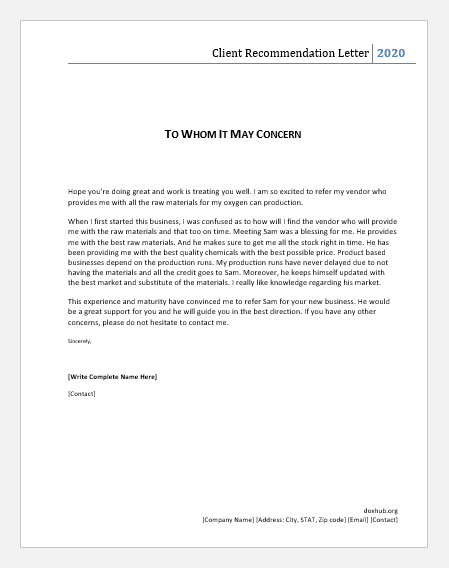 Client recommendation letter can simply be a letter to endorse your service or it can even be a referral to other businesses. When someone appraises your skills and recommends your services, it adds to your credibility and it makes it easy for a new client to make the decision. 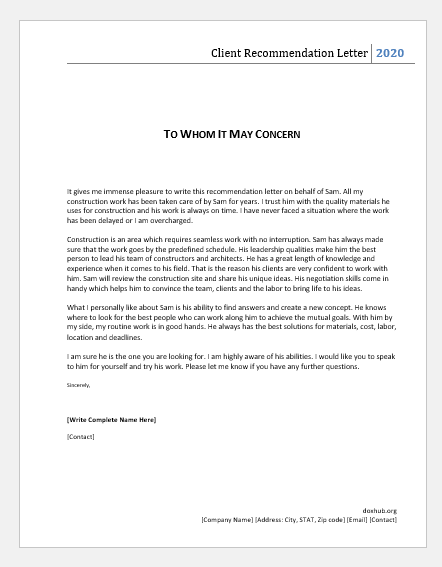 The client recommendation letter should always be true and fair without any fake exaggeration. This letter should be very formal, with a polite tone and professionally written. 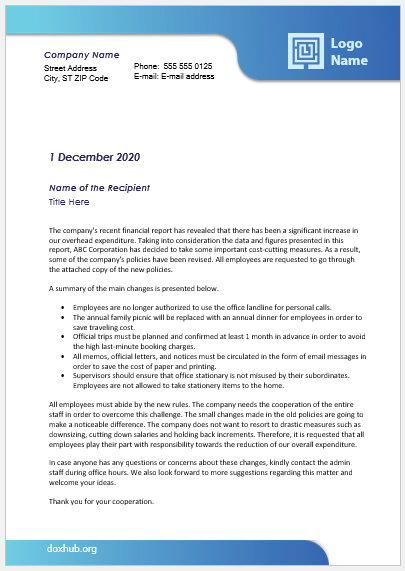 The contact information of the party writing the letter and to whom it is send should be mentioned. Mention the services you availed, the benefit your business had from those services and why would you recommend them. This will help the business trust the service and they might use it as well. As you are already recommended by someone, your potential client might not look at any references or reviews at all. The client has all the facts and figures he needs and he does not needs to look around for more validations. I am so excited to write you this recommendation letter. I have been using the bookkeeping and accounting services of XYZ Company. They are absolutely awesome. I started using their services one year ago and my business has faced major positive changes since then. My debtors are paying in time and my expenses are under control. My cash flows are running smoothly due to which the health of my company has improved a lot. The accountants are giving me a weekly report regarding the debtors and financials. Even a non-financial manager would understand their presentation. 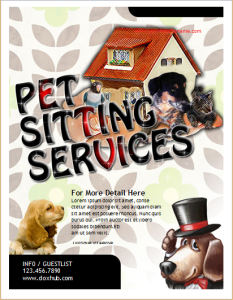 Not just the services are awesome, the team is well groomed and works effortlessly. They are charging me a very decent rate and so I would like to recommend you to use their services too. Please let me know if you would like to know any further and I will be happy to help. Construction is not an easy industry. It involves a lot of risk and cost. That is one of the reasons people and companies would rely on referrals. When writing a referral, make sure to mention the true picture. Avoid any exaggerated situation. Write about all the services you have acquired and how your experience has been so far. The potential customer would be looking for certain services. It is always a better idea to talk about the relevant services to aid the other person to make an informed decision. 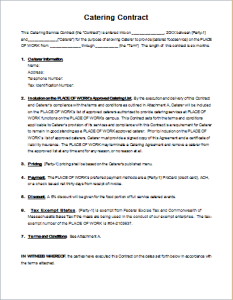 As you have already used the contractor, you do not need any further details. But you can ask the contractor to provide you with any presentations, proposals and the portfolio of clients they have worked with. Make a positive recommendation that should be indicated by your words. And always provide your contact details so that you can answer any specific questions. 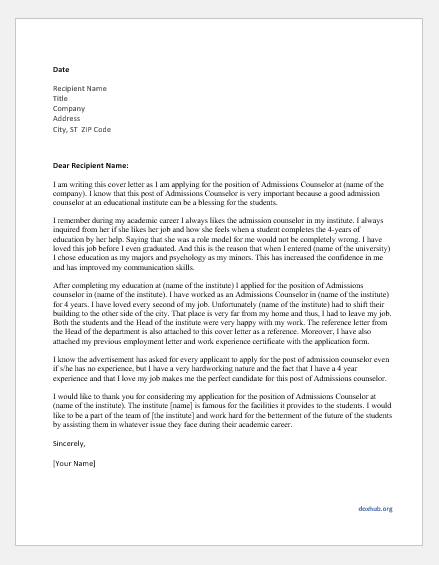 It gives me immense pleasure to write this recommendation letter on behalf of Sam. All my construction work has been taken care of by Sam for years. I trust him with the quality materials he uses for construction and his work is always on time. I have never faced a situation where the work has been delayed or I am overcharged. Construction is an area which requires seamless work with no interruption. Sam has always made sure that the work goes by the predefined schedule. His leadership qualities make him the best person to lead his team of constructors and architects. He has a great length of knowledge and experience when it comes to his field. That is the reason his clients are very confident to work with him. Sam will review the construction site and share his unique ideas. His negotiation skills come in handy which helps him to convince the team, clients and the labor to bring life to his ideas. What I personally like about Sam is his ability to find answers and create a new concept. He knows where to look for the best people who can work along him to achieve the mutual goals. With him by my side, my routine work is in good hands. He always has the best solutions for materials, cost, labor, location and deadlines. I am sure he is the one you are looking for. I am highly aware of his abilities. I would like you to speak to him for yourself and try his work. Please let me know if you have any further questions. 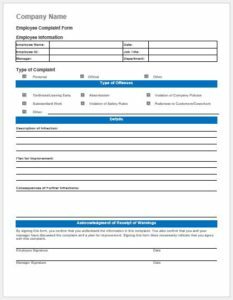 Vendor recommendation letters are written to a business or a client to refer the services of a trusted service provider. The letter should be polite and brief. 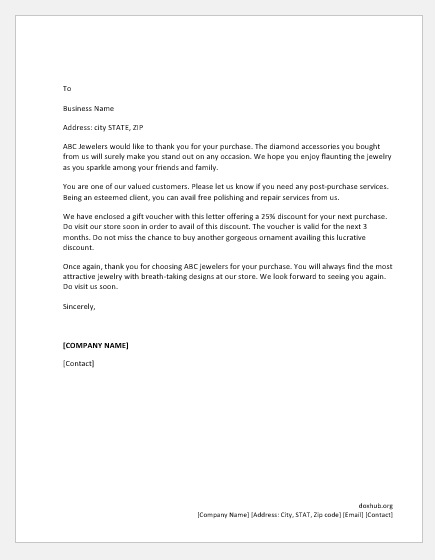 The letter is more like a testimonial stating the reasons and benefits of choosing a supplier. This helps a person to make an informed decision rather than doing research and searching for the best one. The letter should maintain a very persuasive tone, solid structure of the letter and a good body. Divide the letter into all the important sections and paragraphs and explain them all well. Mention how you know the vendor and what benefits you have got from them. Explain the situations and instances that made you refer them. Writing real life examples can be more useful. End the letter with a hope that you wish them to have as an amazing experience as you did. Hope you’re doing great and work is treating you well. I am so excited to refer my vendor who provides me with all the raw materials for my oxygen can production. When I first started this business, I was confused as to how will I find the vendor who will provide me with the raw materials and that too on time. Meeting Sam was a blessing for me. He provides me with the best raw materials. And he makes sure to get me all the stock right in time. He has been providing me with the best quality chemicals with the best possible price. Product based businesses depend on the production runs. My production runs have never delayed due to not having the materials and all the credit goes to Sam. Moreover, he keeps himself updated with the best market and substitute of the materials. I really like knowledge regarding his market. This experience and maturity have convinced me to refer Sam for your new business. He would be a great support for you and he will guide you in the best direction. If you have any other concerns, please do not hesitate to contact me.